Have you ever made a card with a paticular stamp in mind and then end up not using that stamp at all? I wanted to use my new SAB set, Vintage Labels, which has all these great designs coordinating with punches. The Old Olive scalloped design in the center here is from that set. It works beautifully with the Medallion background stamp. But what I was really going for was to use the oval one with a mesage in it. When I got that far on the card, there just wasn't room. 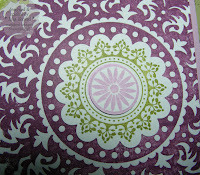 Splitcoaststampers color challenge this week is to use Rich Razzleberry, Old Olive and Orchid Opulence with a dessert option to use swirls. I subbed some Lavendar Moon from Papertrey Ink for the Orchid since I had that in ribbon. My dessert was going to be the swirly oval stamp but my card got too full to have dessert! DSP: Old Olive by SU! This card is so beautiful! I love the colors, and I love how you used that Vintage Label stamp in the center of the medallion! Fabulous! strength training workouts it gets slightly more complicated.